Pinterest is one of my favorite social media platforms for retail businesses because it offers an excellent medium for them to market their brand in an aesthetically pleasing way. Not to mention, it’s a whole lot of fun. However, the number of brands that pin and populate boards without putting a strategy in place has become rather painful to witness. As much as we all love drooling over “Yummy Recipes” or repinning pics of cute, cuddly critters all day long, let’s face it: that’s not going to get your brand any feasible recognition. In fact, brands should take due diligence to make sure they’re always pinning properly and following the right etiquette. With that being said, I’m here to give you 5 quick tips to help you improve your Pinterest marketing strategy so you don’t wind up looking like a total social media noob. One of my biggest pet peeves is seeing businesses that don’t take the time to come up with unique names for their boards. Picking one of the defaults like “Food” or “My Style” looks incredibly lazy. Not to mention, it’s not going to make a consumer want to engage with your brand. One of my favorite examples of creativity comes from Whole Foods. Aside from my major affinity with cheese, I absolutely love this board because it’s so fun and clever. They could have taken the easy route and simply named the board “Cheese,” but how would that have set them apart from any other grocery store chain? Moral of the story: Before you rush to throw up a mess of random boards, take the time to get creative. If you come up with something fresh and fun that your consumers can relate to, you’re guaranteed to keep their interest. Unorganized, chaotic boards that have zero relation to a brand are stressful. Being that Branding Personality is a marketing agency, we would look pretty silly having Pinterest boards labeled “Good Eats” or “Wedding Inspiration,” wouldn’t we? Sure, it would be fun, but it doesn’t relate to our brand strategy in any way whatsoever. As with all marketing endeavors, you want to make sure your marketing strategy is cohesive across all channels. Never confuse your audience with the irrelevant. Offer them valuable content that is compatible with your brand and they will be much more encouraged to repin. Imagine putting a visual on Facebook or Twitter and not including a description with it. It would look ridiculous and rather insufficient, wouldn’t it? Well, the same etiquette goes for Pinterest. Pinners want to know exactly what it is they are looking at. Otherwise you chance losing their attention. Your descriptions don’t have to be a mini novel (in fact, you shouldn’t do that because it comes across as spammy), but you should always take the time to write out a short, informative description that encourage Pinterest users to click on the address of the pin. Trust me, I of all people know how fun (and extremely addicting) Pinterest can be. But that doesn’t mean you have to take it to the extreme. In fact, it’s counterproductive for your brand. How would a pinner expect to know what content is truly important to you if you’re overloading their feed with a gazillion images every hour, on the hour? Even if the content were super awesome (and by awesome I mean a half-naked-Ryan-Gosling-riding-into-the-sunset-on-a-real-life-unicorn-awesome) no one would want to be bombarded with something over and over and over. Space it out and give people time to absorb information before you pin something new. I think we can all agree that Pinterest is a place to have fun. Yet, it surprises me how often I come across brands that completely forget this absolutely crucial factor. 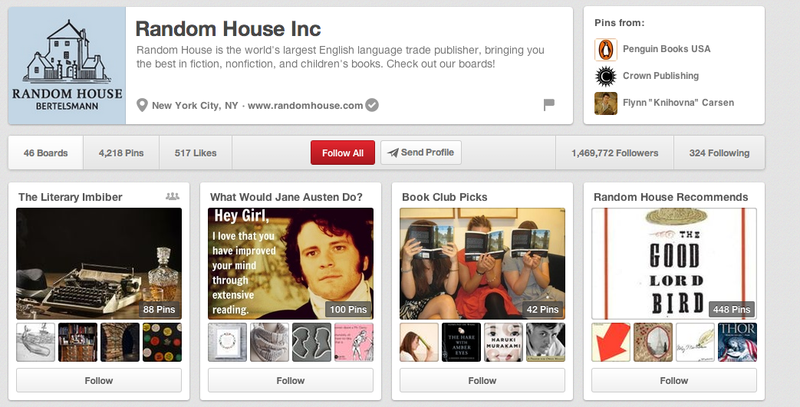 One brand that I absolutely love on Pinterest is Random House, Inc. Not only do they have a whopping 1.4 million followers, they also know how to create a wealth of fantastic content to keep those followers entertained. From Bookish Nooks to Novel Nail Art, their content is extremely creative and unique. Not to mention, they take the entire book literary experience to fun, new heights. If you’re still feeling overwhelmed about getting started with your Pinterest marketing strategy, we’re here to help! If you have any questions, comment below or send us an email. We’d love to propel your brand forward and help you reach your social media marketing goals for 2014. Good advice for brands for Pinterest. I guess another one to add is never have pins with links to spam or off brand content. Make sure the links are great on topic click troughs. Pinterest has found to have attracted 10 million unique viewers faster than any other standalone site in history,we’ve pinned down a set of guidelines for pinners old and new. You have a sort of social contract with your audience on Pinterest.Pin only the things you have permission to pin. Keep that in mind when you’re repining like crazy. No one likes a repinner. Repin only those things you find truly valuable and worthy of sharing. Companies such as Curalate are simplifying the process and making contests easier on Pinterest; brands would be wise to take advantage of such services. Very good information I see many brands who exactly do these activities which you are trying to mention in your article and then they are still waiting for some good results with these activities. I think they should read your article and understand how to promote your brand in Pinterest and other social media platforms. I also did same activities on my video animation Inc. blog and I got very good results that is why I am saying. Ryan Eisenacher+, Thank you so much for shared such an amazing informational about pinterest.